I don't like decorating for Halloween. All of the flat surfaces in my house are cluttered with junk. Even if I put decorations out, you couldn't see them. The kids have costumes and we visit the pumpkin patch, but that's about it. For Anna Jane's first Halloween, I felt pretty good about making her costume. I put her in bright pink long johns from Target and made her butterfly wings out of craft foam. 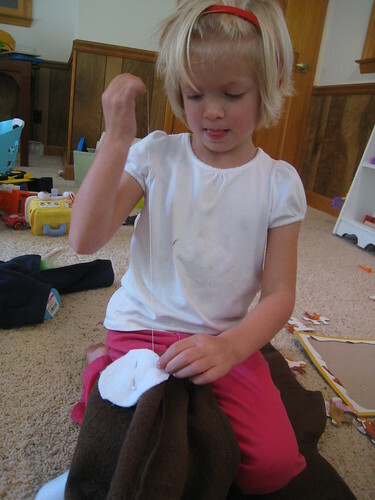 The key for me was that she could still fit into her carseat, so I attached the wings with velcro. She had a little pink toboggan that I attached pipe cleaners and pom-poms to for antennae. Very cute. Can't find a photo. For her second Halloween she was a ballerina. Not a lot to make there. 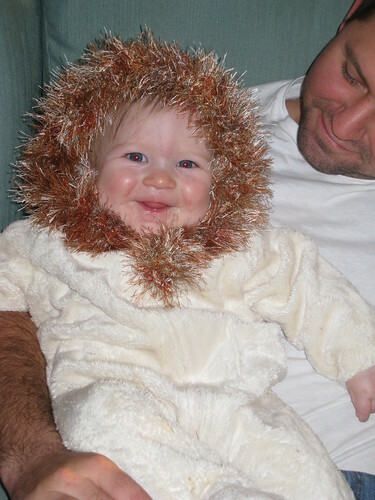 On her third Halloween she wanted very much to be The Lion King. I made these as well. This was around the time when the wild knitted scarves were all the rage, so I bought some fun yarn and made a mane and tail and other furry spots. And since the costume design took up all of my creative energy, I decided to make two so that Wilson could be a mini Lion King. Then, for Anna Jane's fourth Halloween....the dreaded costume choice....a princess. My first idea was to make something over-the-top-fancy. I thought that if she was going to be something as tacky and cliche as a princess, then we were going to make it as tacky and frilly and pinkalicious as we could. And then I took her to Toys R Us and we bought a princess dress. I saw the excitement that she could barely contain. I saw myself paying cold, hard cash for a costume that many other girls would have on. I loved every minute of the experience. I realized that she didn't care if her costume was one-of-a-kind. I didn't particularly enjoy making costume-y clothes. I decided I would never make their costumes again. In the years to follow, these were the costumes chosen by the kids: princess (twice), Dorothy from the Wizard of Oz, superman, batman. 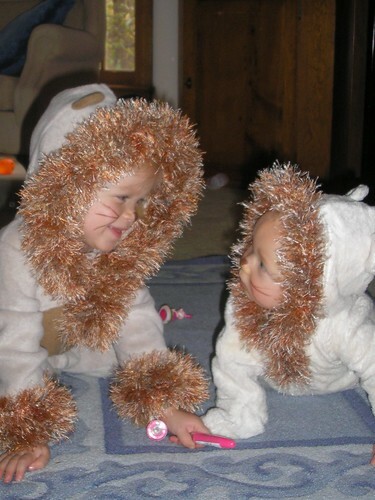 Henry wore the small Lion King costume his first year. This year Anna Jane has chosen to be a brown spotted puppy dog. Wilson chose a spiky T Rex. Or a fiky T Rec if you ask him. Since I'm not all gung-ho about Halloween, I don't look all over the place for the best costumes. The one place I did look had only one dog costume: Scooby Doo. 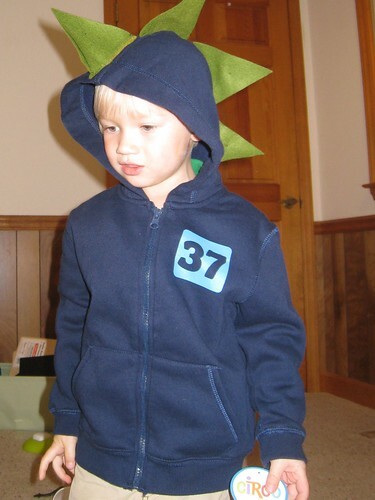 And the only dinosaur costume I found cost $25. Nope. Not for us. So I bought two sweatsuits and resigned myself to the fact that this year's costumes would have to be handmade. I won't reveal the final products, but I can tell you that Wilson has his spikes. And they look good. And Anna Jane wore her puppy dog costume to a birthday party this evening. 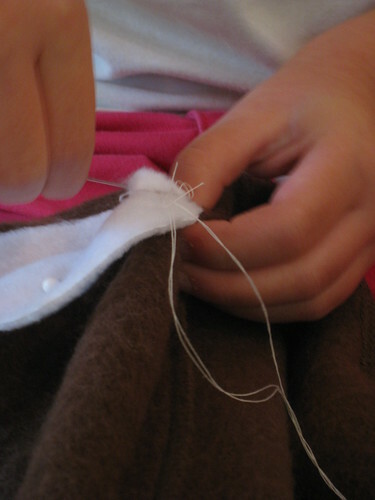 And the spots were sewn on in a way that it looks like a five-year-old made it! when was anna Jane dorothy from Wizard of Oz?